This gorgeous remodeled interior showcases the high end finishes like a new home! 1.6 acres w/ attention to detail at every turn. 2200 SF The floor plan feels much larger and very functional. Seller is motivated! Walls of windows!! This is the one you have been waiting for! Landscaped yard with park like setting in the mountains. New custom deck with beautiful mountains views! Main floor living at its finest!! Paved driveway with RV parking and tons of storage! Stunning new gourmet kitchen w/ granite, custom tile and top of the line SS appliances, drop dead beautiful wide plank flooring thru out,MAIN FLOOR MASTER SUITE w/ all the bells and whistles, 2 Enormous BR upstairs w/ HUGE walk-in closets, Granite Jack & Jill bath, new carpet, new paint, walk out lower level offers a fantastic rec area/family room, solid hemlock wood doors throughout ! Turn key home! 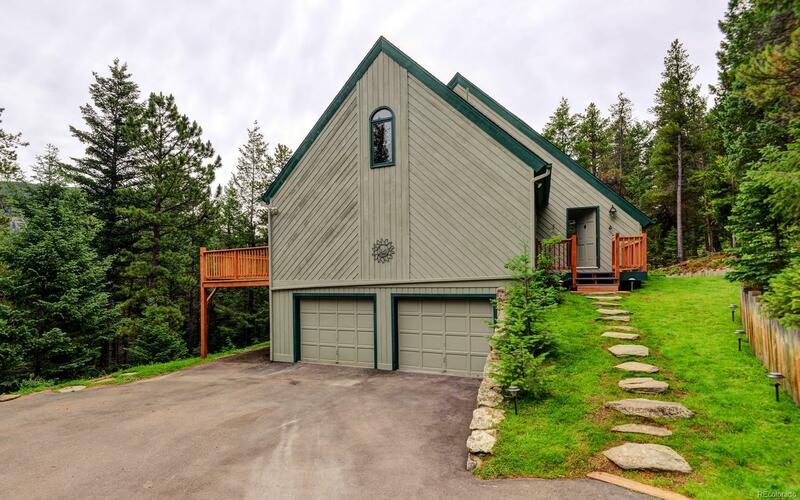 Super simple commute to downtown Denver and Evergreen! Easy commute to world class skiing and all the amenities you need.